Outlook: One of the best AFL defenders of the past decade, McPharlin is close to the end of his career. He’s decided to play on in 2015, which is bad news for the AFL’s elite power forwards. What the coach says (Michael Prior): Has been sensational this pre-season. Had injury concerns toward the end of last year but he hasn’t missed a beat. We’re very pleased with where Luke is at. reliable self in the heart of the Fremantle backline. McPharlin was on course for a second All Australian jumper until a calf injury kept him out from rounds 16-23. He returned to play a huge part in the finals series. Luke McPharlin’s excellent season was recognised with selection in the 2012 Four'N Twenty All Australian team. The defender was named at the full-back position after an outstanding year in which he helped Freo recoRnd the second-fewest points conceded in the AFL behind premiers Sydney. More often than not, McPharlin played on the opposition’s most dangerous forward and rarely lowered his colours, conceding an average of just 1.4 goals per game to his opponents. He took the second-most marks (8.1 per game) in the competition in 2012, and he used the ball at a brilliant 86.6 per cent efficiency – the best by any defender in the AFL with 10 or more appearances. Ultimately, a hamstring injury in the final game of the season cost him a richly deserved opportunity to play finals and probably a Doig Medal, which he was leading by five votes after round 23. An absolute champion, McPharlin has signed on until the end of the 2014 season. McPharlin played perhaps his best season of AFL in 2011. The athletic key defender was impenetrable all year long matched up against the opposition’s star forwards and a top four finish in the Doig Medal was just rewards. He topped the club for total marks (129) and rebound 50s (65) in 2011 and ranked fourth overall for disposal efficiency (79.8) and total effective kicks (150). His partnership in defence with Antoni Grover was a highlight and will again be called upon to stop the goals and help develop young backmen Alex Silvagni and Peter Faulks in 2012. 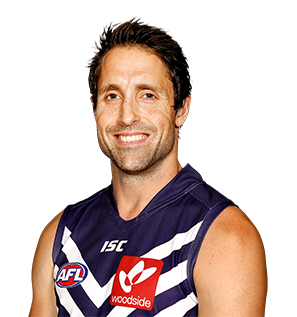 McPharlin played his 150th game for Fremantle in the round 18 Carlton Mid Derby, qualifying for Life Membership at the club. It was a milestone to remember for the key defender as Freo recorded its biggest ever winning margin against West Coast. McPharlin’s athleticism was on full show in 2010, with his soaring mark against Melbourne at Subiaco Oval in round 16 nominated for Mark of the Week. A crucial member of the backline, he regularly took on the opposition’s best forward every week.